Quietstone Light was installed behind robust, anti graffiti, anodised aluminium perforated metal to control ambient noise levels and improve acoustics for the audio installation. The inspiration came from Berlin based sound and light artist: Hans Peter Kuhn. The goal being to transform the once dark archways, creating a unique experience for pedestriansand drivers alike. 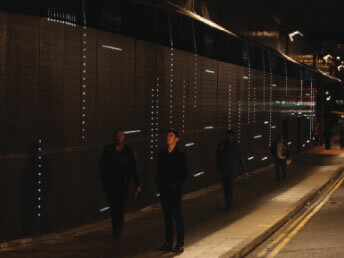 Thousands of LED lights were installed in the aluminum walls which form patterns as drivers pass through and the ambient noise is controlled by our Quietstone Light panels. These provide an unexpectedly tranquil passage through the tunnel and also serve the audio installation which further improves the ambience by playing urban music throughout.